View from the south, capturing most of the remains. 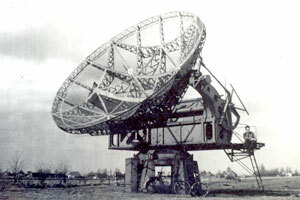 A Würzburg Riese antenna used for ionosphere and radioastronomical research by Dutch telecom company P.T.T. in Nederhorst den Berg. The southern socle of a Würzburg Riese (R2). Construction of the radarstation took eight weeks in July and August 1943 and started with the building of the still present small buildings, the so-called Feldmässige Ausbau. These have the appearance of a garage (G1 to G3) and provided shelter for the power units. Next was the Auswertung T-Baracke built for the Stellungs Zentrale in which the information was processed. This was a T-shaped building which was built for other stations as well. The foundation of this building is probably (partially) still present (F1). 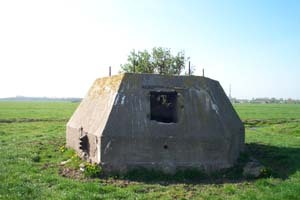 There are a few remaining Auswertung T-Baracke like those of the stations 'Sneeglöckchen' near Schagen (North-Holland), 'Brenessel' near Brielle (Zuid-Holland) and Teerose I near Terlet (Gelderland). 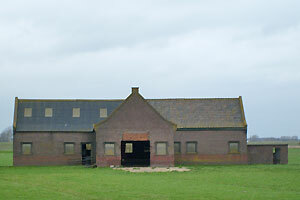 To the east of the farm came two or four long barracks. North of these barracks was a rectangular, compartmented basin, probably a waterreservoir in case of fire. Also, southwest of the farm Breedland, a large complex of three, in U-shaped lay-out, interconnected buildings arose. It provided accomodations to NCO's (non-commissioned officers) and Luftnachrichten-Helferinnen with in between a building for heating, toilets and showers. The foundation beams can still be found. Also a Wirstschaftsbaracke was build for offices and perhaps cantine. Probably part of the foundations is still present (F1). Near and parallel of the small, old Papelaan road two large wooden towers, square groundshape with sides of 6 metres appeared - probably the so-called Heinrich Y-trackers. The foundations of these are still present in the field. And lastly a small square-shaped building as the southeast corner of the station, probably a Knotenpunkt with a phoneline to the secundair road. On British aerial pictures the ditches for the cables being digged between the wooden towers and the square building can be seen. 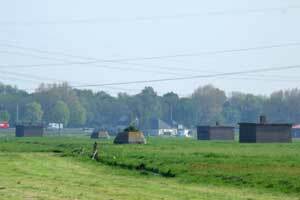 In the fields between the buildings and the Papelaan (road) several earth covered shelters were made. Within a month, on August 29th, 1943, the radarstation was connected to the military telephone network (with 4 double lines?). The radarstation was operational on August 31st. Although the two Würzburg Riese socles (R1 en R2, 300 meters distance) are present for the large and heavy parabolic-antennas, it is remarkable they are not recognisable in the aerial pictures. According to multiple witnesses antennas of 5 to 6 meters in diameter were actually put onto the socles. The resistancegroup Albrecht also reports "2 listening-installations shell-formed" but with a diameter of 3,5 metres. Perhaps there was an error made (radius?) or smaller antennas were installed? The station was one of the last ones being built. Probably because it had to close a gap in the radar coverage.